MigraPure has been tested in a double-blind, placebo-controlled clinical trial conducted by three top headache experts with results published in top-tier medical journals. Sublingual administration allows the immediate absorption of full-strength active ingredients through the capillaries under the tongue. Users report that relief often starts in minutes. The following is a listing of clinical studies and subsequent articles resulting from the sublingual homeopathic formulations of Feverfew 3X/Ginger 2X created by DMR Biologics LLC Founder Russ Mitchell. The original formulation utilized a water base and was later upgraded to a lipid base. These studies were all designed using the formulations as an acute treatment for migrainous headaches and associated symptoms. The patented lipid-based LipiGesic formulation has been licensed to DMR Biologics LLC and has been renamed MigraPure. 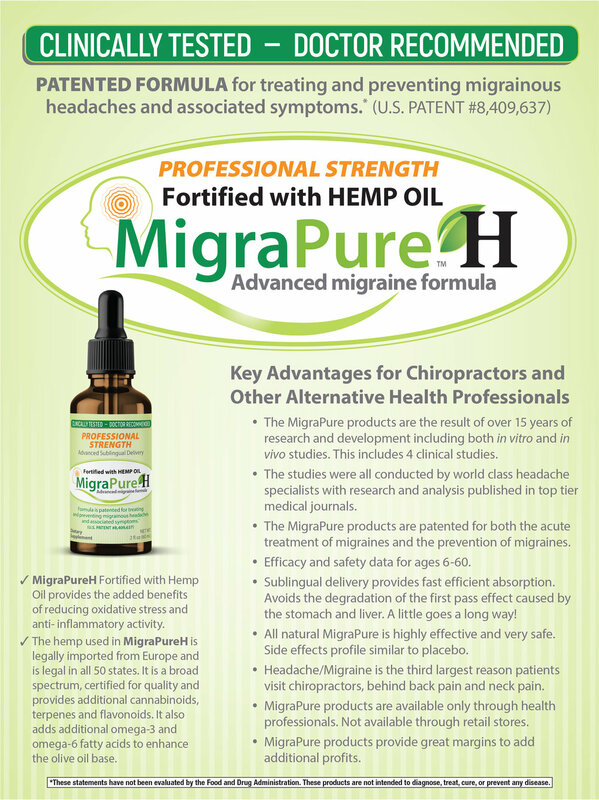 All future products based on the patented formulation will be marketed under the MigraPure banner.